The pneumatic v type regulate ball valve has special fixed V-shaped notch ball and adjustable metal valve seat. When the valve is closed, it will cut V-shape between the V-shaped notch and the valve seat, which can avoid being jammed. The pneumatic v type regulate ball valve is self-cleaned, it is especially suitable for the mediums containing fiber, sewage and sticky particles. The pneumatic v type regulate ball valve can be equipped with valve locator for continuous control. 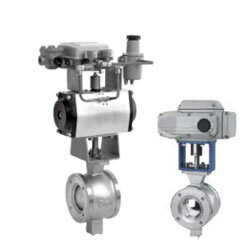 With low flow resistance, wide control range, it is a high-quality control valve that widely used.. The pneumatic v type regulate ball valve is adjustable for flow.